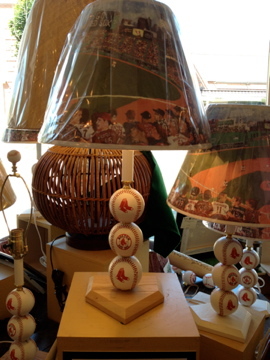 We sell this wonderful lamp at Concord Lamp and Shade in Concord MA. At night it turns into a “night game”-all of the lines and lights turn bright white. The names of the Red Sox players are on the shirts of the fans watching the game. The balls that make the base are regulation balls and the base is made of ash ( like a baseball bat.) Great gift for fans!! This entry was posted in lamps and shades and tagged Baseball, Children, Concord, Home, Home Improvement, Red Sox, Sports. Bookmark the permalink.